24. Every segment enclosed by a straight-line and section of a right-angled cone is a third again a triangle having a base that is the same as it and an equal height. (diagram 1) For let segment ADBEG be enclosed by a straight line and a section of a right-angled cone, and let ABG be a triangle having the same base as the segment and an equal height, and let area K be a third-again triangle ABG. (diagram 2) One must show that it is equal to segment ADBEG. For if it is not equal, it is either larger or smaller. Let segment ADBEG first be, if possible, larger than area K. (diagram 3) I inscribed triangles ADB, BEG, as stated, and I inscribed also in the left over segments other triangles having the same base as the segments and the same height, and I repeatedly inscribe two triangles in the segments that come about afterwards that have the same base as the segment and height the same. The remaining segments will be less than the excess by which segment ADBEG exceeds area K (Prop. 20, corollary). Thus the inscribed polygon will be larger than K, which is impossible. For since the successively placed areas are in a ratio of four-times (Prop. 21), a first, triangle ABG, is four-times triangles ADB, BEG, and then these same ones are four-times those inscribed in the following segments, and repeatedly in this way, it is clear that the areas altogether are smaller than a third again the largest, and that K is a third again the largest area. (Prop. 23, as the sum is 4/3 the largest, ABG, - 1/3 the least. whatever it is) Therefore, segment ADBEG is not larger than area K.
(diagram 4) Let segment ADBEG be, if possible, smaller than area K. Let, in fact, triangle ABG be equal to Z, H a fourth of Z, and similarly, Q a fourth of H, and let them be repeatedly and successively placed, until the least is less than the excess by which area K exceeds the segment, and let the I be smaller than the excess (Euclid, Elements, X 1, and in effect taking away 3/4 the remaining amount). In fact, areas Z, H, Q, I and a third of I are a third again of Z (Prop. 23). But K is also a third again of Z. Therefore, K is equal to Z, H, Q, I and the third part of I. And so since area K exceeds Z, H, Q, I by something smaller than I, but exceeds the segment by something larger than I, it is clear that Z, H, Q, I areas are larger than the segment, which is impossible. For it was proved that if areas, however many, are placed in succession in a ratio of four-times (Prop. 21), but the largest is equal to the triangle inscribed in the segment, the areas together will be smaller than the segment (Prop. 22). Therefore, segment ADBEG is not smaller than area K. But it was proved that it is not larger. 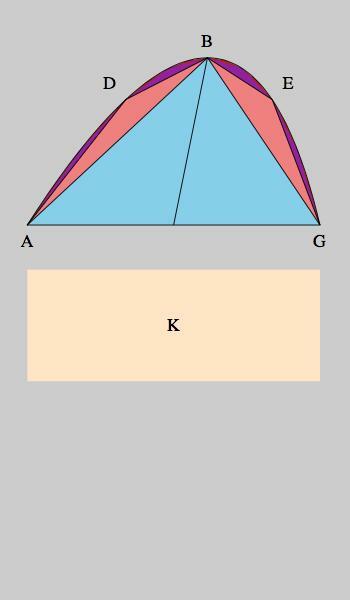 Therefore, it is equal to K. And area K is a third again of triangle ABG. Therefore, segment ADBEG is also a third again of triangle ABG. Let Zn < K - ADBEG (this is possible because each Zi+1 = 1/4 Zi and so Zi - Zi+1 = 3/4 Zi > 1/2 Zi. So at each step one takes out more than half and so can get a magnitude smaller than any given. The theorem is Elements X 1, and the same principle underlies the argument for the corollary to Prop. 20.